Tomato plants are extremely popular garden crops because they are relatively easy to grow, and yield large amounts of tasty fruit that differs vastly in quality from the product available in grocery stores. Many modern varieties of tomato plant are disease-resistant strains. However, after a heavy rain, tomatoes may begin to wilt for a variety of reasons. There really is no cure for wilting tomato plants, but several preventative measures gardeners can be taken to diminish the effects of wilting after a heavy rain. Tomato plants need frequent watering, except after a heavy rainfall. 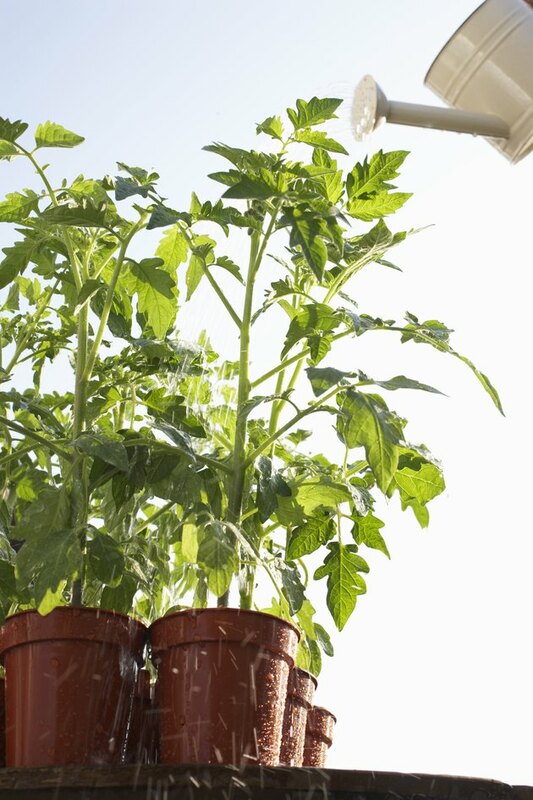 Tomato plants thrive in most climates, but do particularly well in hot climates with weekly watering and fertilization. When there is too much rainfall in a short period of time, the roots do not have the ability or necessity to rapidly absorb all the water. This causes them to become waterlogged. Waterlogged roots essentially suffocate because they cannot survive without air and room to expand. One of the first signs of poor soil drainage and root rot on a tomato plant is wilting leaves. Proper soil drainage is essential to prevent tomato plants from acquiring waterlogged roots and root rot. Bacterial wilt develops in tomato plants after heavy rainfall. It can cause the plants to appear as though they aren't getting enough water, but soon the tell-tale black spots and soft stems signifying bacterial wilt appear. Once tomato plants have bacterial wilt, there really isn't anything to be done. Gardeners can remove all the plants with bacterial wilt and try to save any that don't show symptoms, but often bacteria, like Fusarium, spread underground into root systems and infected the soil. 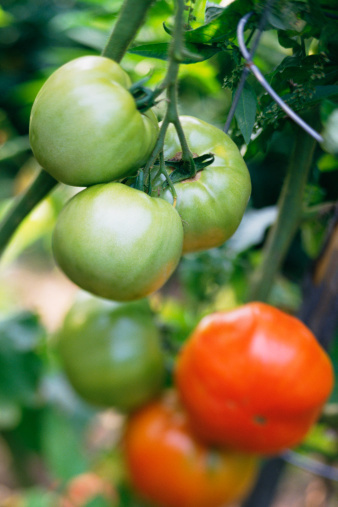 Placing tomatoes on a raised bed is one way to ensure proper soil irrigation and avoid bacterial wilt. Another solution is to cease all watering for several days directly following a heavy rain. If it rains every day, try digging irrigation ditches that drain water away from the plants. Typically, light rains do little damage, but a prolonged period of unending rain for several hours or over the course of several days requires some additional effort to drain soil. Many gardeners with compacted soil use preventative measures at the beginning of the growing season. Planting tomatoes on a raised bed is one way to ensure soil drainage. Another is to till soil supplement with peat moss or another loosely-compacted soil modifier into the garden bed before planting. Using a tiller in this way is similar to lawn aeration in that root systems are better able to spread horizontally and vertically when they aren't pushing through compacted soil. Tomato plants have a better chance of surviving a heavy rain if the soil is broken up and allows for the growth of strong healthy root systems.